Last week arrival of Acer’s first Chromebook in India was made official and this Chromebook along With HP’s Chromebook will be available for purchase in India, at Reliance and Chroma stores starting from October 26th this month. Let’s take a look at what HP is offering. 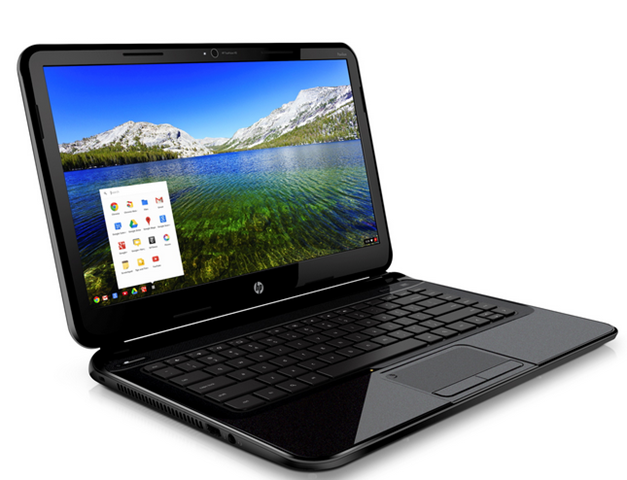 HP Chromebook has been priced at Rs. 27,000 which is well above Acer’s offering at Rs. 22,999. This Chromebook comes with a larger 14 Inch HD BrightView LED-backlit display with 1,366 x768 pixel resolution. This Chromebook will be powered by Intel Celeron 847 processor of 1.1 GHz based on Haswell architecture which will lead to more efficient battery usage. This Chromebook will work on Google Chrome O.s. which required constant high speed internet connectivity. RAM capacity is 2 GB which can be further extended to 4 GB. Internal memory is only 16 GB and you will get up to 100 GB of storage on the cloud. The battery backup is 4.5 hours which is lesser compared to Acer C720, but still above average. This Chromebook has 2 USB 2.0 ports, and one 1 USB 3.0 post. HDMI connectivity is also present in this Chromebook. Chromebook is a device for those who like to live on the cloud. If you are in touch with High speed internet connectivity throughout the day, you get to keep your data easily assessable where ever you move. We don’t expect this concept to be a runaway success in India, where most users don’t enjoy this kind of connectivity. Chromebook will also make sense to Linux users who can install Linux O.S. on Chromebook and enjoy the benefits of high battery capacity. The limited physical storage will still be an issue for those of us who don’t prefer to live on cloud.